Congratulations to Pack 300, which has launched their new website! Special thanks to Deb Kopas, the webmaster. 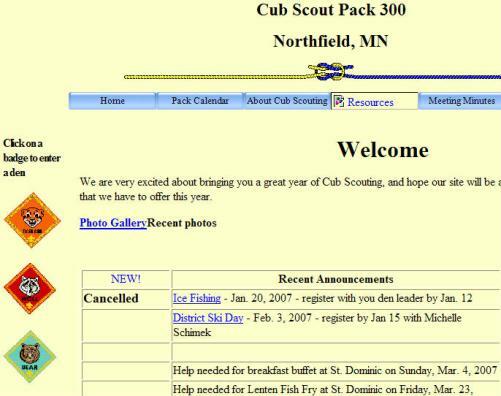 As Cub Master, I officially invite you to visit www.cubs300.org. If your son is in Grades 1-5 and wants to have some fun, contact me at 507-645-9020. January 16th is our Piinewood Derby, the legendary race of scout-crafted cars. For more intensity, come to the Rolling Hill District Pinewood Derby, hosted by Pack 300 at St. Dominic’s School on 17 March 2007. Check out the website for more details!